There aren’t many Young Adult books I want to read more than once. Don’t Call Me Ishmael is one I’ve read three times. I’m in awe of Michael Gerard Bauer’s writing skill. The book dealt with a topic I feel passionately about: bullying. Bauer had me in a constant ripple of laughter, without detracting at all from the serious theme. Ishmael, the main character, is in Year Nine, and tormented by a bully named Bagsley. How Ishmael copes, the friends he makes, the embarrassment, the fear and the triumphs, combine into a compelling story. Bauer has Ishmael’s voice down pat. I also admired his writerly eye for detail, and his obvious understanding of what it’s like to be a bully’s target. 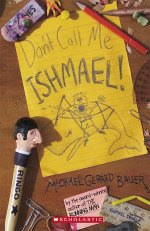 Published by Omnibus (Scholastic), in 2006, Don’t Call Me Ishmael is one of my very favourite books. It would make a great text for study at high school level, with so many possibilities for discussion. It would also be a wonderful book to read aloud to anyone who loves humour. Don't just take the Book Chook's word for it, read an excerpt online. What's it like to be bullied? What's it like to be a bully? What's the difference between teasing and bullying? What can we do if we are being bullied? There is immensely helpful information about coping with bullying on the internet. We need to discuss bullying with our kids and remind them they are not alone. The torment of being bullied has led to some terrible tragedies. I believe anything we can do to root it out of our society is worthwhile. Such a relevant issue, and one I see all the time with families I know. I think books like this should be required reading for school kids to make them more aware and empathetic to the plight of kids who are targeted by bullies. Everyone knows the harmful consequences of these actions, and yet somehow it continues as if it's just an inevitable consequence of childhood. Furthermore, kids who actually do the bullying are often a sign of having their own problems, either at school or at home, a fact that should be addressed, as well. Thanks for your insight and suggestions. Looks like a great book.I'll haveto pick it up. I need some great young adult fiction. I agree with you that this is a rampant problem, with today's youth especially. The more we can do to prevent it, the better for all of society. These kid are our future. No one wants a world filled with adult bullies. Great review. Phredude, I truly believe books are a great way to raise awareness of all sorts of issues. When the author manages to be wonderfully entertaining as well, like Michael Gerard Bauer, he deserves our praise. My first picture book will be published later this year. In it, I tackle bullying from the other point of view - the bully's. My hope is that it will become another valued resource in the fight against bullying. Lisa, I would love to know if you enjoy it as much as I did. Bauer truly is an excellent writer. Ms.Lucy, I take your point about today's youth especially. I think the problem is, there are so many new ways to bully because of new technology. And, from what I read, there are adult bullies in the workplace, in homes, and in institutions. Hard to believe that we humans can make something as beautiful as a poem, yet are still capable of making people's lives a misery. Hi again! I just sent you a "Great Buddy" award. Come and see it on my blog. Dear Susan, Please keep us updated on the big launch date of your book. How exciting is that? I can't wait, and best of luck with it. Phredude, you will hear me across the seas! OMG, I read Bauer's blog and I never laughed so hard in my life! Check out his post on Richard Dreyfuss Syndrome! I'll have to find the URL and send it to you! P.S. Just ordered his book! So glad you think he's funny, too, Corey. I do sometimes wonder if my sense of humour is shared by anyone else on the planet! I hope you get to read Ishmael. Let me know what you think of it, Laura. I predict Batman will love it in a few years time. I've read it. It is boring!